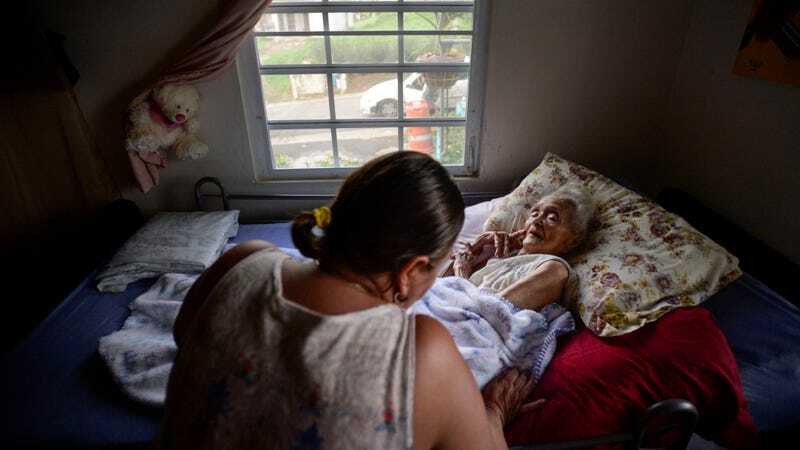 96-year-old Rosa Maria Torres, San Lorenzo sector, Puerto Rico. Image via the AP. On Friday, Governor Ricardo Rossello and interim director of Puerto Rico Electric Power Authority Justo Gonzalez announced that, months after Hurricane Maria devastated the island, only 55 percent of Puerto Rico’s roughly 1.5 million customers have power. That’s a slow crawl from the 50 percent reported in November and a far cry from his October promise to have restored power for 95 percent of the island by now. The U.S. Army Corps of Engineers has told ABC News that they estimate the island will not have full restoration until May. The lack of power has also delayed record-keeping, which has skewed mortality rates, according to the New York Times. Last week, the Times published a report estimating that, based on comparative statistics from previous years, the death toll could be as high as 1,052–a horrific uptick from the Department of Public Safety’s official count of 64, and Trump’s famous early-October brag of 16 deaths. “[I]t is troubling that it took five days before any senior federal official from 4 the U.S. mainland visited the island to survey the damage,” they add.